From walking to talking to eating with a spoon or fork and all the etiquette that is necessary to function in our society, depending on culture and geographical location. When you are an adult, you then repeat everything you learned to your own children, with a few edits as you put your own personality on it, including input from your partner/spouse who might be from another culture. Of course, we are ever evolving, so what was condemning for children to do or say when you were young no longer applies to your own children, which in itself is already strange for most of us when we go through that awareness. And now, you yourself are suddenly in a position that your parents are getting to an age where you know every moment counts. Everyone, especially in the Western world, knows that we deal with more than old age; Alzheimer’s is on the rise and other debilitating diseases that I had never heard of as a child are now prevalent. Our ailing parents have cancer, diabetes, multiple sclerosis, just to name a few. Again, in the West, we try to let our parents be independent as long as possible in their own home, until, suddenly, we are faced with needing to intervene and either take care of them or put them in a home. Neither decision is easy… both has its merits and its problems. What astonishes me every day while taking care of my father is that the lesson that I teach: “It is not about you, but about them” is more true than ever. We touch their hands and think they are freezing. We think they should drink or eat. We feel pity, anguish, and guilt. But like I said, it is not about you. It is about their last chapter and how to possibly do it in such a fashion that it becomes a good memory for all involved. You are going to tell me that is impossible, as you have to deal with difficult dynamics within your family. And often, like in my case, your parents are divorced and remarried to other partners/spouses. So, how to navigate? How to enjoy the moment without fretting? For me, I believe you need to give them the space, care, and dignity to be themselves, no matter what that means for them. For those with Alzheimer’s, just know they are hidden in there, and from time to time you get a glimpse that freezes time and space, and you know deep inside that this is the right thing, no matter how many other moments in the day feel impossible. 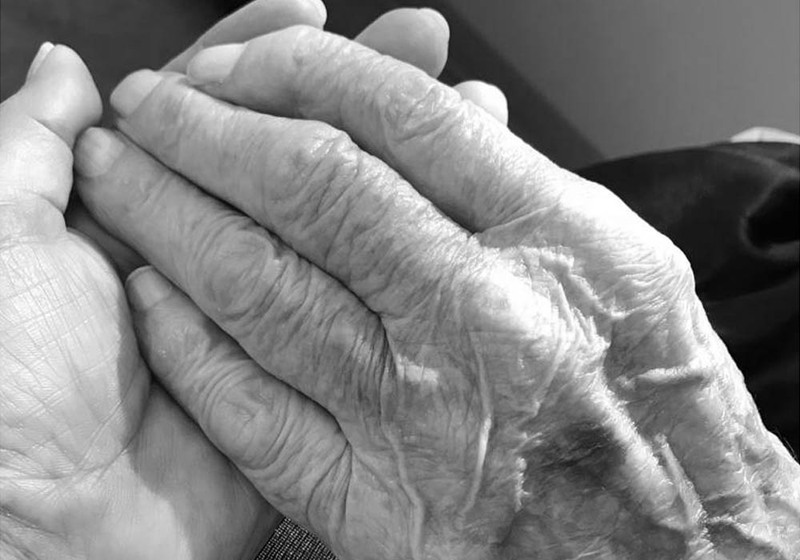 My father keeps his big hand cupped ever so gentle around my cheek and softly, but with strength, pushes my head onto his chest and just strokes my hair while my tears are flowing freely. In this one moment, my dad has no Alzheimer’s, no dementia. He is in this moment the most caring I have ever known him to be. For I have a crazy theory: no matter who we become as adults, no matter if it is good, bad, or ugly, when we become old or very sick, we once again become that beautiful child we once were. I am so certain that I saw the child my father was, a caring lovely young boy, who grew up in a household of 11 children. He was not only gentle and kind, he was truly empathic, which most young children are. All his good qualities came to the surface during this one incredible, intimate moment to give his adopted child solace.